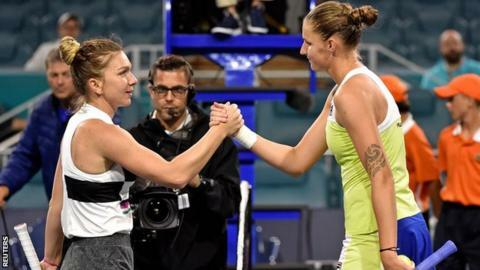 Simona Halep missed the chance to return to world number one after losing 7-5 6-1 to Karolina Pliskova in the Miami Open semi-finals. Czech Pliskova, 27, won nine straight games, and 10 of the last 11, to fight back from 5-3 down in the first set. Halep would have topped the rankings if she had reached the final but Naomi Osaka will stay as world number one. Fifth seed Pliskova will meet Australia's Ashleigh Barty in the final after she beat Anett Kontaveit. Barty, 22, reached the biggest final of her career by winning 6-3 6-3, breaking the Estonian's serve on five occasions on a rain-interrupted day in Miami. "It was a very long day, I know we had to wait around but it was an opportunity to drink some coffee and watch the golf so I was relaxed," she said. Pliskova's win over Halep had to be stopped twice because of rain, including when the Czech was leading 7-5 5-0. "It wasn't easy waiting for so long but I managed to stay aggressive," said Pliskova after their 1am finish.